Your cocktail hour should be like a souped-up version of your favorite happy hour. Think about it: It's early in the evening, and you have all of your friends together with your favorite drinks, apps and great music. When planning your menu a great place to start is the appetizers. You will want to make sure that you have something to fit everyone's tastes. On our menu we will provide you with any three of the passed appetizers on our menu for $8 per person. I usually recommend choosing a seafood option, a vegetarian option, and a meat option. You can also choose to do more than three appetizers each passed app after your first three choices are $2 per person. 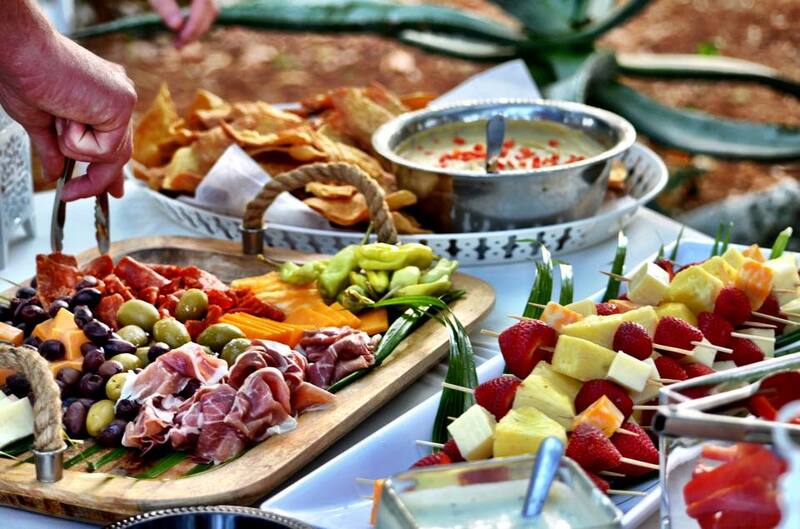 You can also choose to do a combination of passed appetizers and an appetizer station. We have a couple tasty stations available or you can mix and match your own! On the left is for sure one of our most popular options. Sesame Seared Ahi Tuna and a wanton crisp drizzled with Creamy Wasabi and Sweet Soy Sauce. On the right is a great meat option Tenderloin Carpaccio tear drops. Pictured here we have (above) a light and fresh seafood option, our Jumbo Lump crab in coconut mango sauce. A great summer option. Below is our coconut shrimp with horseradish marmalade dipping sauce. Pictured here is our Proscuitto wrapped asparagus. Pictured here is our grilled mango shrimp, chicken potstickers with Thai Sweet Chili Sauce, and a keys favorite, Conch Fritters with a Bimini Sauce. Follow us on FB to see more images of our work. Contact us at Caribbean Catering for more ideas for your cocktail hour! One of the most important things on your wedding day or any event really is the timeline, and a realistic one at that. This is one of the things your planner should draft for you based on the activities you have planned for your day. There are so many things that need to be squeezed in! It is important to budget your time wisely and have your day of coordinator there to ensure that the timeline is followed accurately to be sure you can fit everything in. It is very easy to get caught up in conversation, drink in hand and lose track of time. It is one of the main reasons I always recommend to at least have a day of coordinator even if you haven't hired a planner. Your timeline should really include all aspects of the day including the rehearsal, set up, hair and make-up and transportation. Today we will take a close look at some of the things to consider for your ceremony timing and choosing the traditions you will include in your wedding day as it relates to creating you timeline. The ceremony timing has its own set of parameters when looking at timing that will vary depending on your ceremony style. If you are having an outdoor or beach ceremony you will want to consider the lighting and time of day. Will the sun be beating down on your guests for an hour long mass? Are you dreaming of a sunset ceremony? If you are planning to have a beach ceremony down her in the Florida Keys you may want to start later in the day when it will not be so hot. If everyone is siting in the blaring sun for they duration they will be sweaty and uncomfortable. So consider starting later or be sure to provide shade and programs that double as fans for you guests. If you would like to have a sunset ceremony you should consider choosing a date in the winter, when the sun sets earlier in the day. This will allow plenty of time for your reception festivities afterwards. Alternatively if you are getting married in the summer when the sun sets later, consider holding your cocktail hour before the ceremony. This will allow you to have your sunset ceremony and have enough time to party after. The pre-cocktail hour will not only save you precious party time but it will account for lateness. 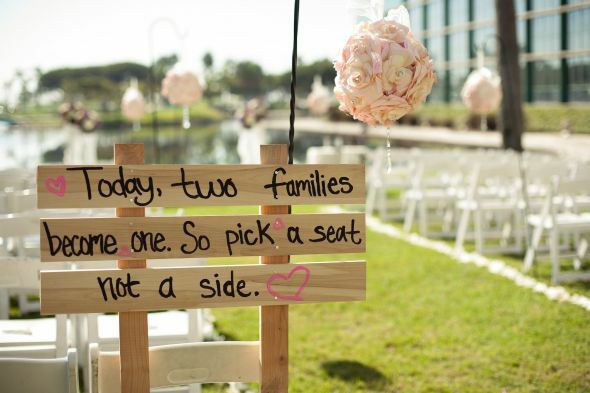 In addition it will also give your guests a chance to mingle and greet each other as they arrive in a relaxed atmosphere rather than feeling rushed directly to the ceremony. 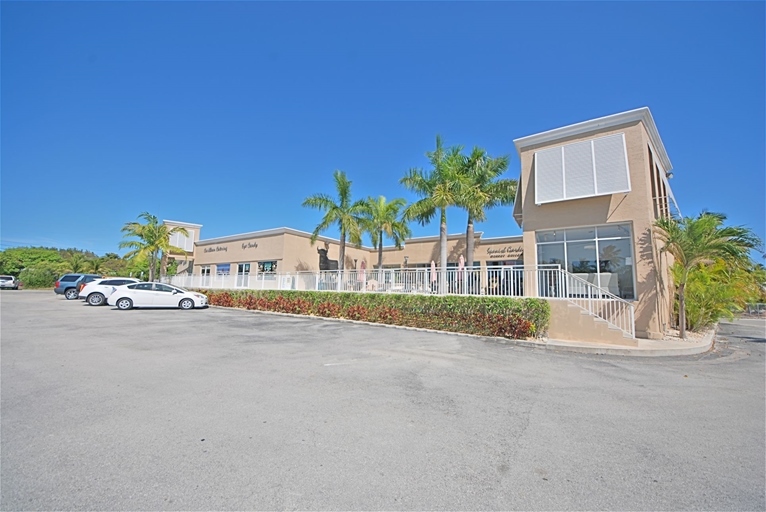 If you are having your ceremony at a separate location from your reception make sure you consider travel time for your guests to arrive at the new location. Arranging transportation for all is ideal, but it can be pricey. If all of your guests are providing their own transportation it may be a bit of a lengthier process. Consider driving time and traffic, as well as quick stops along the way and chatting at the church before hitting to road. This is just a basic list of traditions that many people include in their wedding reception. Each culture has it's own wedding traditions that they include so the list can start to become daunting. I always recommend couples take the time to think about the experience they want in a wedding day when choosing which of these they want to include in their reception. Some want them all and some want none. A wedding, in general, lasts about 5-6 hours so the more structured activities you have planned the less time you will have to mingle and spend time with your guests. It's great to do it all, but I must say I have done so many weddings where they have everything possible included and the bride and groom never seem to have the opportunity to enjoy! Take a minute to think about what is important to you on this day before trying to do it all. Make sure you have wisely budgeted your precious time on your wedding day. This post includes the parts of your timeline that will have the most effect on your experience of your wedding day. Our goal is for your wedding day to be an amazing and memorable experience! That is why we want you to know the facts when it comes to the anatomy of a wedding day. 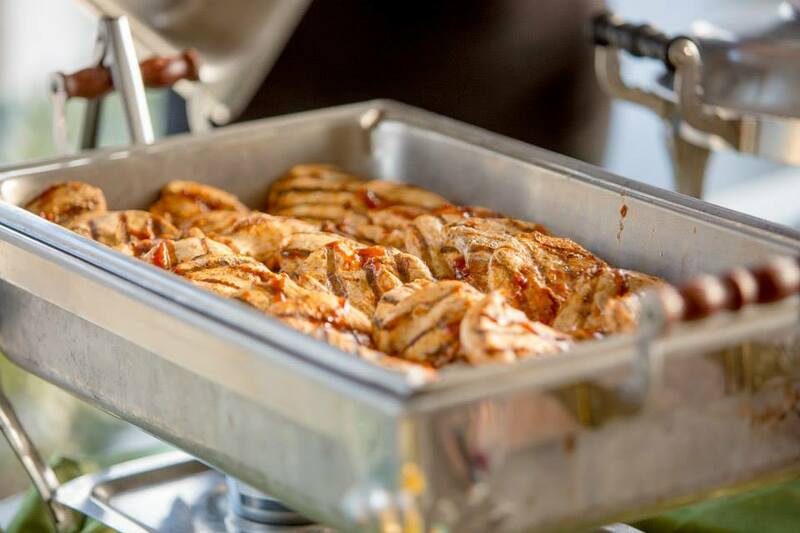 Contact Caribbean Catering for more advice on making your time work for you. Our wedding couple over the weekend are both avid fans of their college teams. The groom an Alabama grad and the bride a Florida grad. 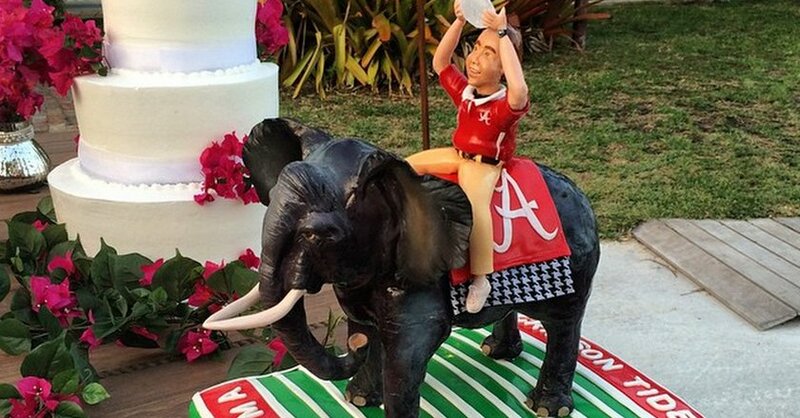 The grooms cake depicted Nick Saban, the Alabama football coach riding an elephant. As a prank, the bride had the inside of the cake colored orange and blue. Gator colors, well played! The story has been picked up by several sports news networks, what a fun moment! Check out some of the news coverage here. So in the spirit of all things groom cake here's some interesting trivia about the grooms cake. The grooms cake can be traced back to Victorian England where the tradition was to have a wedding cake, a grooms cake and a brides cake. The wedding cake would be served to the guests and the other two would be served to the bridesmaids and groomsmen. The tradition evolved and eventually made its way across the pond and has remained popular in the US, especially in the Southeast. Traditionally the grooms cake is not served at the wedding reception. Typically individual slices are boxed up for the unmarried women to take home. Legend has it that if you a single woman sleeps with a slice of grooms cake under her pillow she will dream of her groom to be! I'd recommend eating it but to each their own. Most don't follow this tradition, it is usually displayed and served with the wedding cake. It is a great way to give the groom some special recognition when most of the focus tends to be on the bride. We love doing fun grooms cakes and our bakers can really work some wonders. Contact us at Caribbean Catering for more ideas for grooms cakes and other wedding desserts.